With an abundance of fresh local fruit in Provence I was determined this summer to finally make homemade preserves. One of my goals for this blog is to share more Provençal recipes. My mother-in-law, Simone, who I have mentioned in other posts and who lives nearby, is a native Provençal with an arsenal of authentic dishes learned from her family. Truthfully I have shied away from food photography as I have not been happy with my results, but as my photography skills improve, I want to share more food from this very special region. 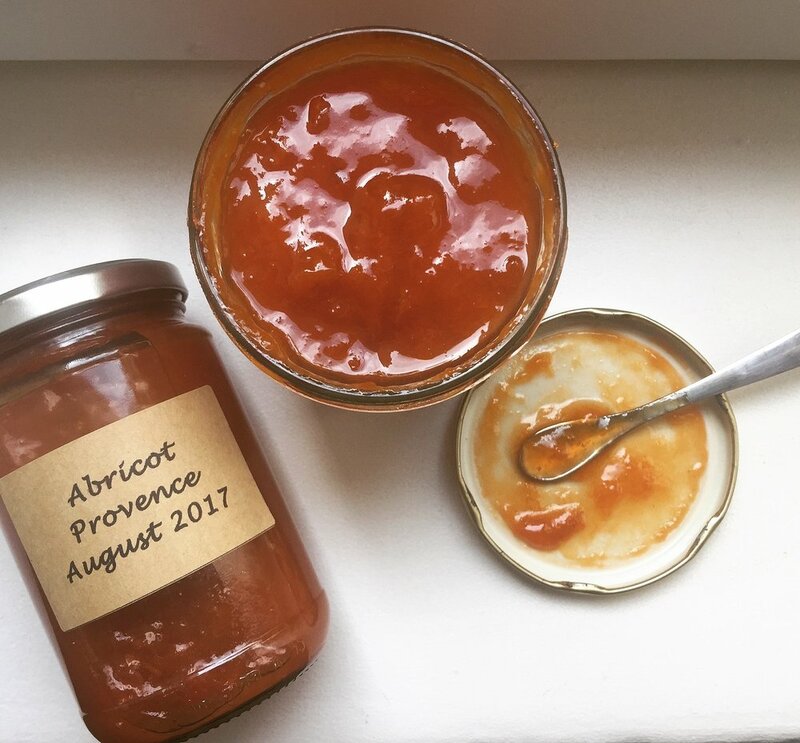 While apricot jam is not a Provençal dish, this recipe is and is also unique… and easy. Admittedly I have never made jam before, finding the whole jar boiling and sealing process a bit daunting. This recipe however requires no special jars and no pectin. The ingredients are ripe fruit and sugar. With a little bit of time, the end result is fresh, sweet jam. 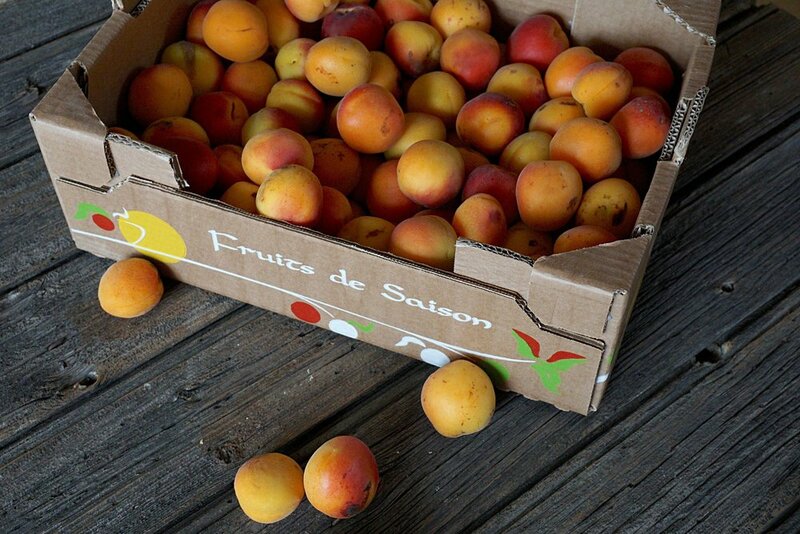 At end season in Provence, the farmers begin to sell the fruit specifically for confiture. 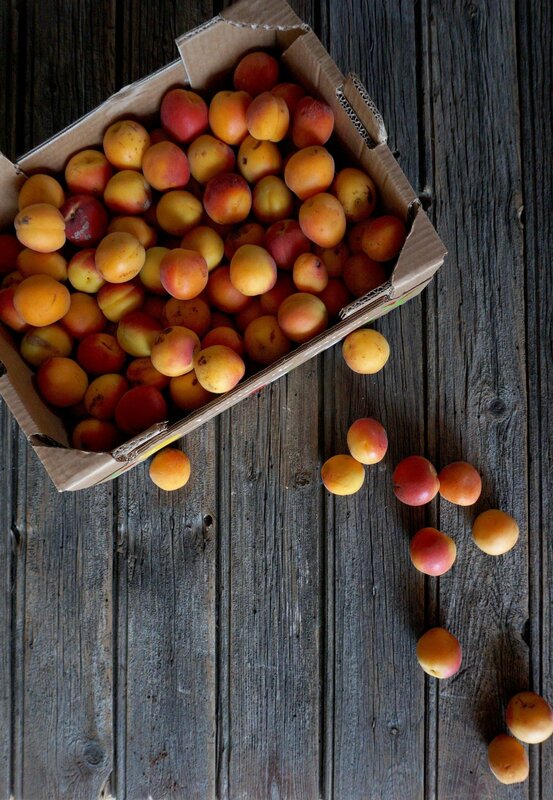 The apricots are extremely ripe, to the point of being over ripened, and should be used within a couple of days of buying or they will rot. If you are not privy to fruit being sold explicitly for jam, you will just want to make sure that the fruit you are using is really, really ripened to ensure your jam is full of flavor and natural sugar. Although this recipe involves an overnight process with three different cooking times, don’t let this dissuade you, as overall it is really rather easy to make. I used the full 500 grams of sugar (per 1 kg of fruit), however this can be adjusted down a bit if you prefer less sugar, depending on the type and the ripeness of your fruit. The recipe calls for 2-3 tablespoons of preserves – homemade or store bought - to be added in the second round of cooking, which is basically added as a thickening ingredient. Simone adds her previously made homemade jam, but if this is not an option for you, make sure to only use a high quality store brand of the same flavor. As I did not have any jam in the house when I began this process, I actually used a small teaspoon of vegetarian gelatin (diluted in water), which also worked. 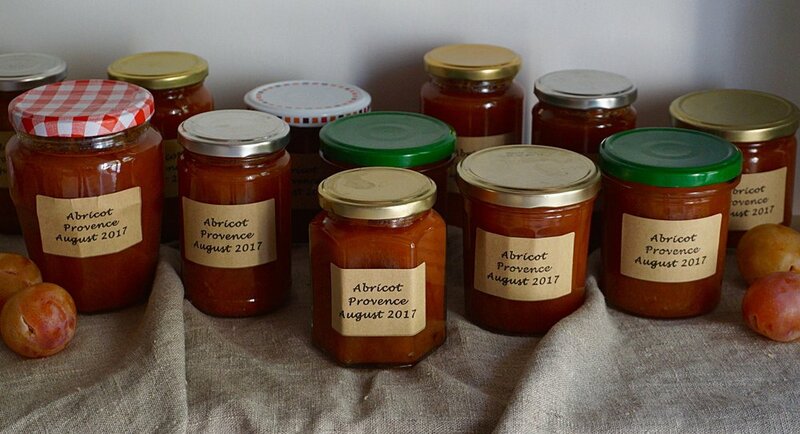 Throughout cooking the jam slowly thickens and turns a luscious rich apricot color, filling the house with the sweet scent of simmering fruit and sugar. The easiest part of this recipe is that no special jars are required. Any store bought glass jar (containing other food) can be used but they must have a tight sealing lid, be thoroughly washed (dishwasher) and fully dried before using. Rather than recycling empty jars, we save them for homemade jams, especially those with unique shapes and non-branded lids. Using miscellaneous jars is a fun way to mix and match different shapes, sizes and colors for your finished jars of preserves. After having made apricot jam, I hope to make peach before the end of the season. I find it a bit nostalgic to savor the taste of summer in other months of the year. Whichever fruit you choose, I hope you enjoy this recipe and find it less daunting than the typical jam making process. It is very gratifying to spread a little sunshine on a piece of toast in the colder winter months and to let your taste buds transport you back to the warmer sun-drenched days of summertime. Bon chance et bon appétit! 1. Wash and de-pit the fruit. Chop into large chunks (halves or quarters for larger fruit). 2. In a large stockpot mix the chopped fruit and sugar well, cover and let rest overnight. Two pots may be needed depending on the amount of fruit used. 3. In the morning, cook the fruit/sugar mix over medium heat for 25 minutes. Stir often to avoid the mixture from sticking to the pot or boiling over. Let the mixture settle and cool. A layer of foam will develop, skim all and any excess water before covering. 4. In the afternoon, add the jam (or gelatin) to the fruit and cook, stirring often, for another 15 minutes. Skim any additional foam. The color should begin to change to a darker apricot hue. 5. In the evening, cook the jam again for a final 15 minutes. 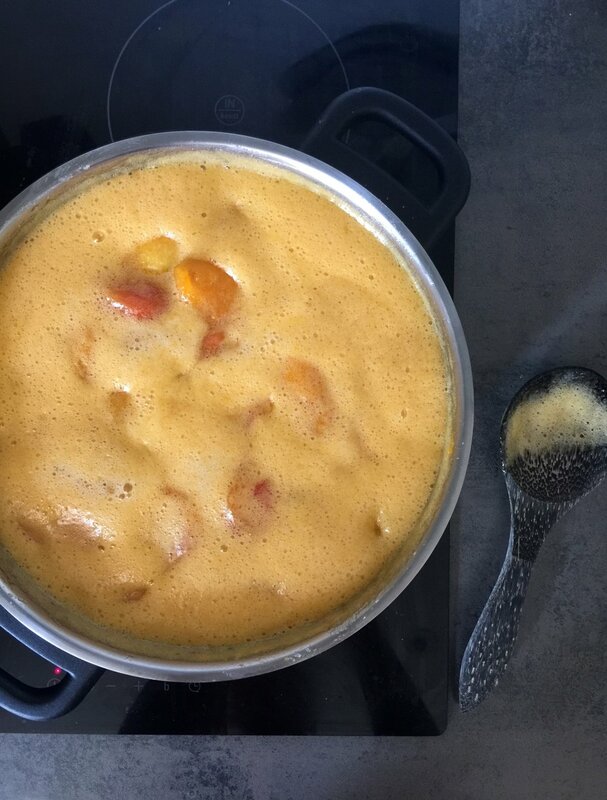 The jam should begin to thicken and should now be a rich apricot color. After 15 minutes, let the jam cool slightly. 6. Using a soup ladle and a funnel, slowly add the jam to the jars, almost filling complete but not to the rim of the jarl. Be careful not to spill as the mixture is very hot and you can easily burn yourself. 7. Once all the jars are filled, gently clean the rim (and jars) of any spilled jam, seal each lid tightly and turn the jars upside down. Let the jam rest (upside down) for at least 24 hours before turning upright. 8. Label and store in a cool dark place. Always refrigerate after opening.